VOLUNTEERS at a community radio station in Bognor Regis are set to host the first event at their new base. The helpers with Radio Respect are getting ready to start broadcasting from premises in Argyle Road in the middle of this month. They are marking the impending expansion with a first event at their re-named studio this weekend. The Blue Room, in West Street, will host a book sale from 10am-4pm on Saturday and Sunday. More than 800 secondhand titles will be on sale. Radio Respect owner Chris Collins said: “Although we only moved to West Street in February, it became evident during the summer, as the radio station and shop became more well known, that we needed a bigger studio and also a private area to sit down and chat with those seeking mental health support. Radio Respect was started in 2013 by Chris and his wife, Caroline Collins, in a shed to bring the mental health community together, help people to understand their condition and provide a friendly voice. It began in the couple’s shed and moved to an office in Station Road. The success of the online broadcasts led to the move to West Street nine months ago. But the need for the radio station and the shop and private space to be separated has seen the second space rented a few metres away, opposite the town’s Foodbank. 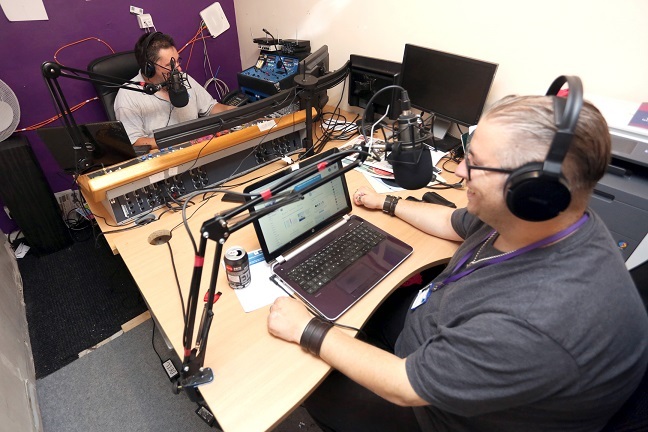 “With our new place in Argyle Road, we can make better radio programmes, with more guests and more shows, while The Blue Room can offer a valuable service for the community, especially those seeking mental health support, which is still at the heart of our plans. “By moving the radio station to Argyle Road, the West Street shop can use the additional space of the old studio to expand the amount of items we can store there, and sell, as currently this is our main source of income,” said Mr Collins. “All the staff are volunteers. Not one of us is drawing a salary. From November 16, The Blue Room will also be the location for four weekly craft workshops to offer the chance to work with air dry clay such as decorating with acrylic paints and clear varnishing the results. Radio Respect also plans a monthly indoor table market in different locations around the town. The first will be on November 18 at Newtown Sports and Social Club in Greencourt Drive.